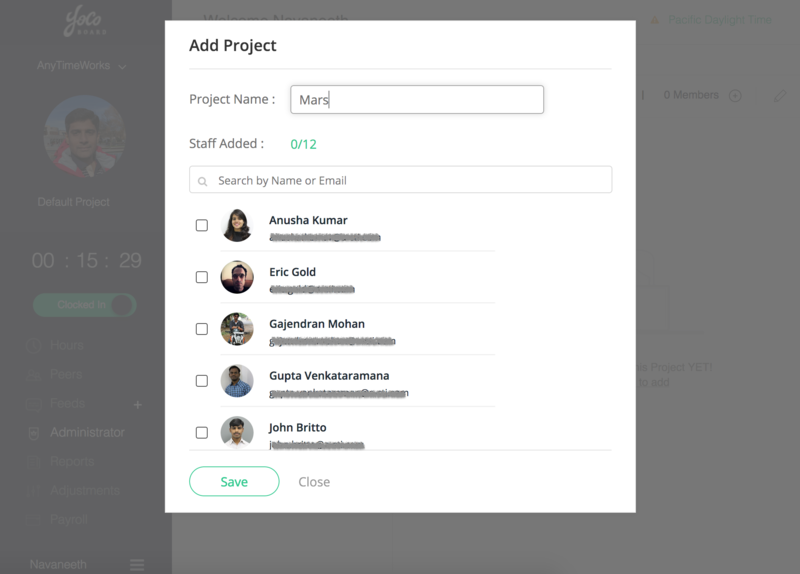 Each member of your YoCoBoard team has a profile consisting of their name, role, timezone, and employee id. In addition, each member has a skill-set made of of toggle switches that can give them certain permissions, such as the ability to clock in and out from YoCoBoard mobile app or the ability to view and edit reports. You can access and edit a given team member’s Profile and Skill-set by first clicking on their name in the Staff list on the Administrator tab. Then, use the Profile and Skill-set options to make your changes. To add a new member to your team, first choose Administrator from the main menu. Enter the person’s email, first name and last name, and then hit Save. Your new staff member is now added! Now you can assign the team member to one or more teams, projects, adjust their skill settings and more! 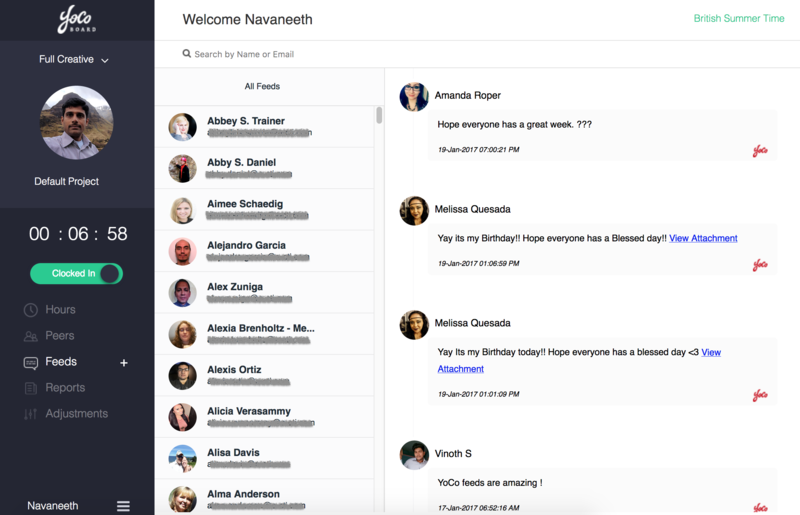 Slack is a popular app for team chat and collaboration. 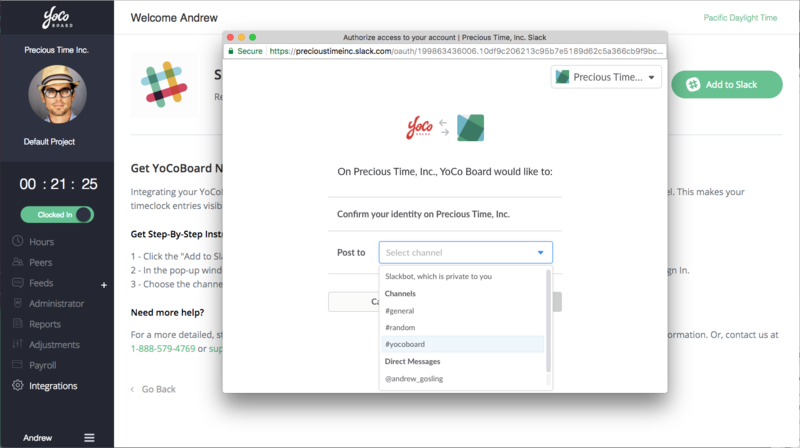 When you create an integrate between your YoCoBoard account and a Slack team, your clock-in and clock-out data will be pushed automatically to the Slack channel of your choice. 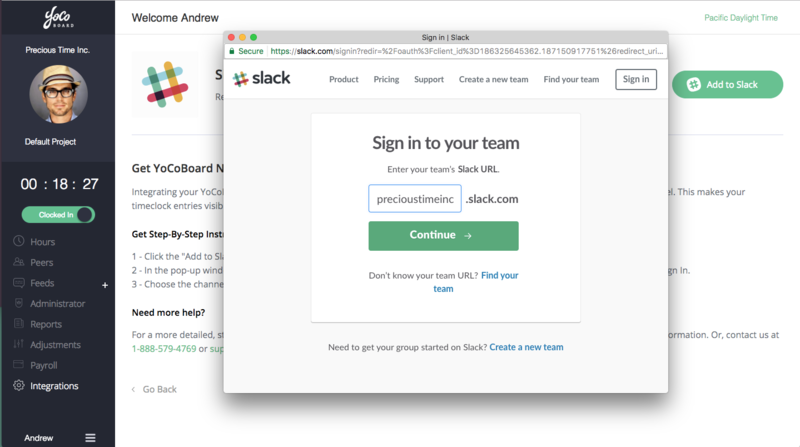 First, you’ll need to set up a Slack team if you don’t already have one. 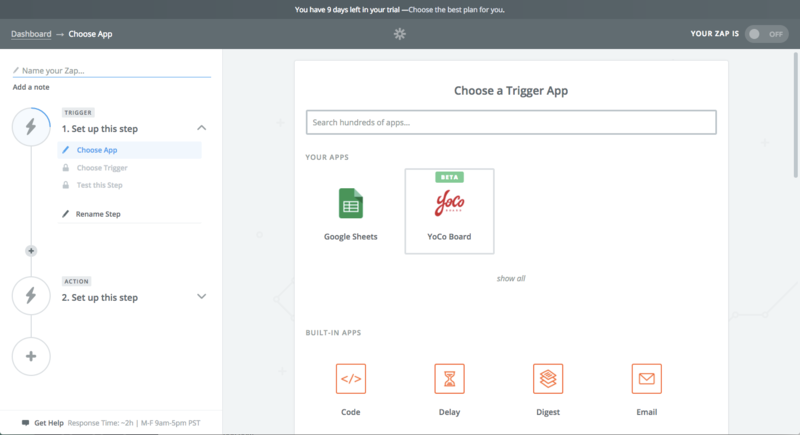 Then, click on Integrations on your YoCoBoard menu. You’ll see some of integrations we offer. Check back in future for more–we’re adding them all the time! 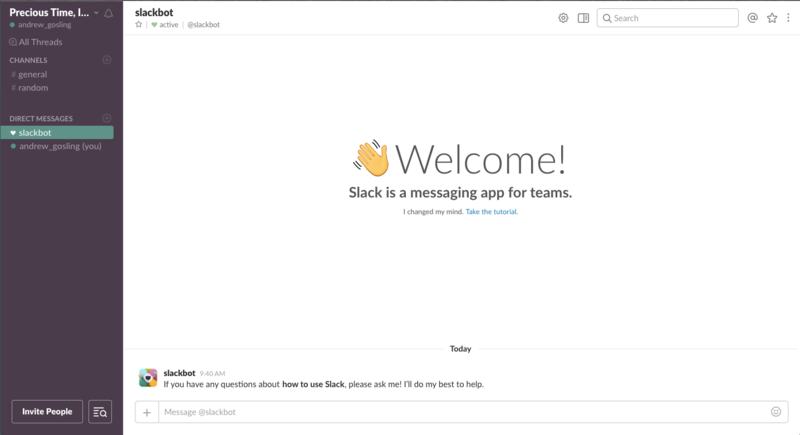 Choose Slack by clicking on that box. Then, click on the green Add to Slack button. 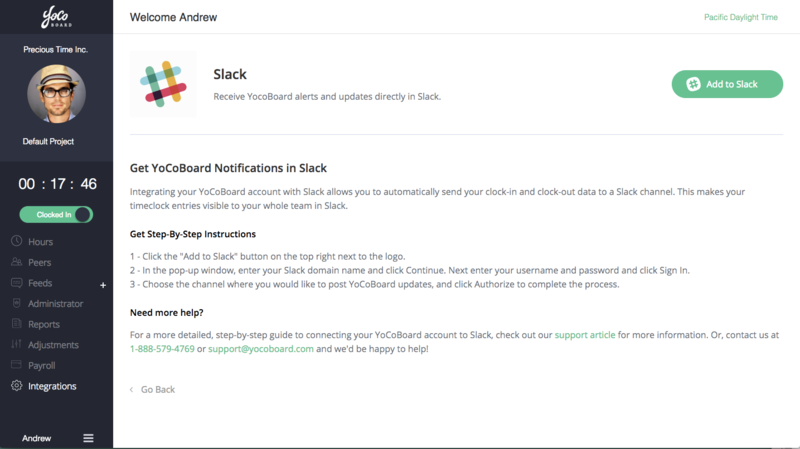 In the window that pops up, enter the name of the Slack team you want to integrate with YoCoBoard and click Continue. 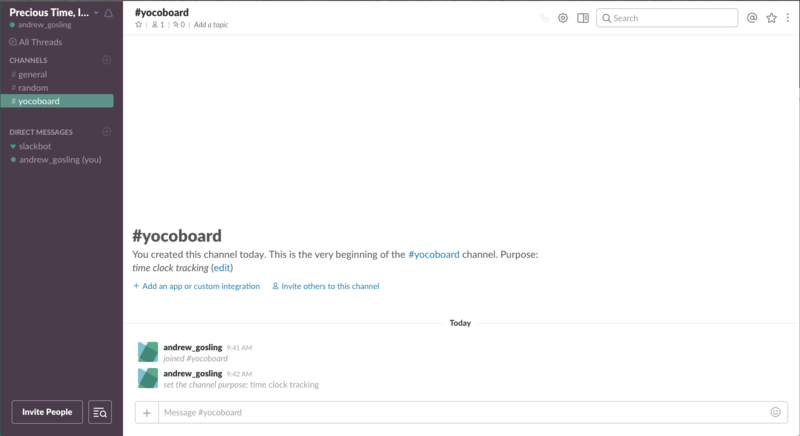 Next, you’ll probably want to set up a designated Slack channel to receive the time clock data pushed from YoCoBoard. Head over to Slack and use the “plus” icon under Channels to create one. You’ll be prompted to name the channel and enter its purpose. 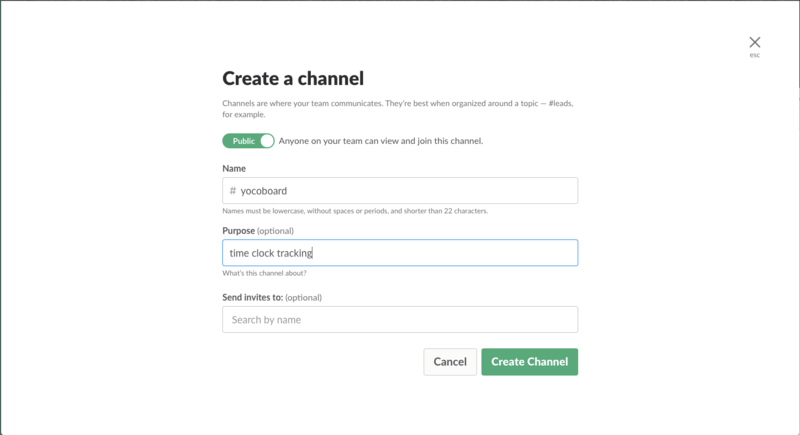 Once you’ve created your channel, you’ll see it in Slack in your list of channels. 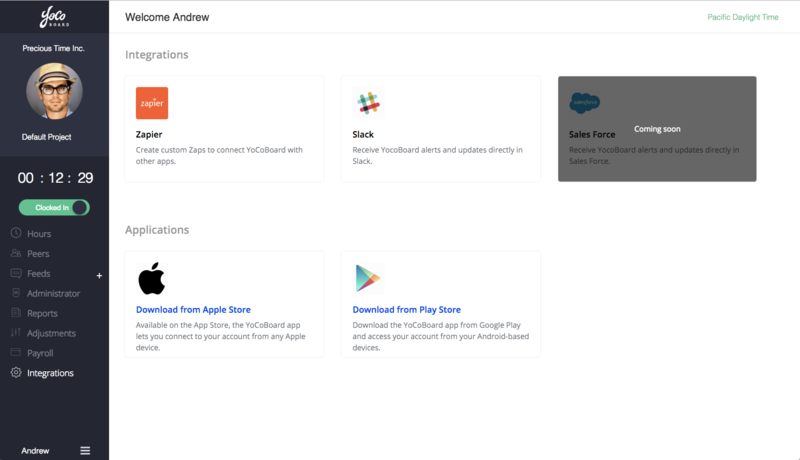 Now go back to YoCoBoard and choose the Slack channel you just made as the one you’d like to integrate. That’s about it! 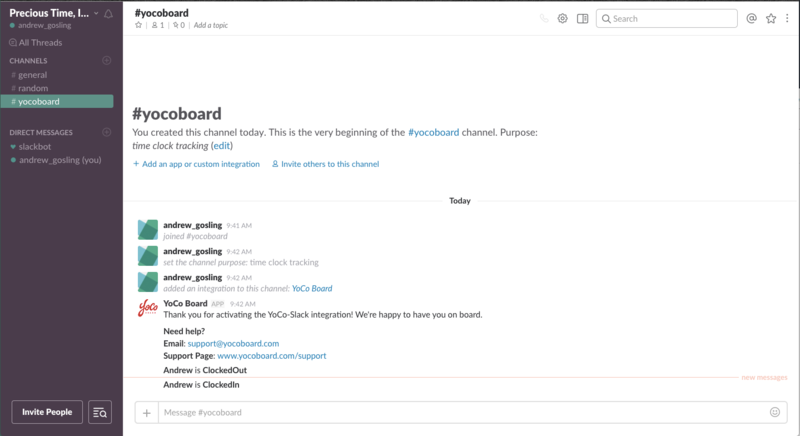 Now, whenever you clock in or clock out of YoCoBoard, an automatically generated message will appear in you Slack channel to let your team know. 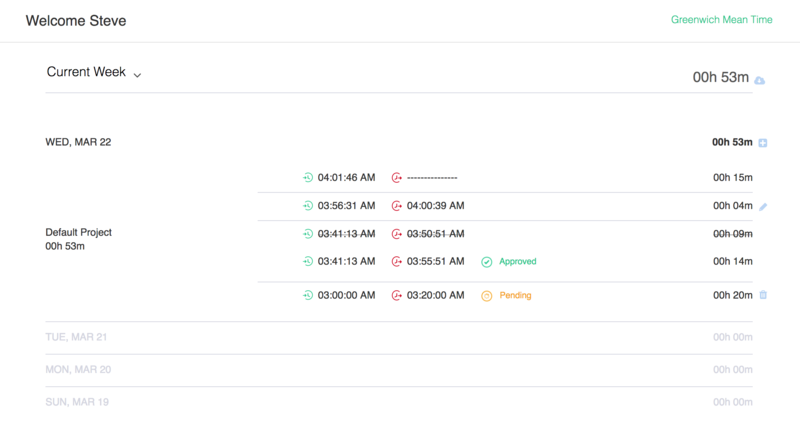 You can create Reports with YoCoBoard anytime, setting a date range and exporting the time clock data as a CSV file. 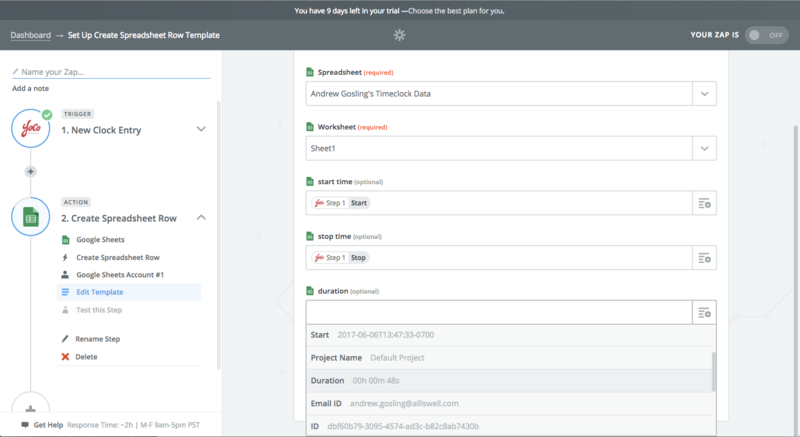 But what if you want to export your time entries to a spreadsheet in real time, automatically? 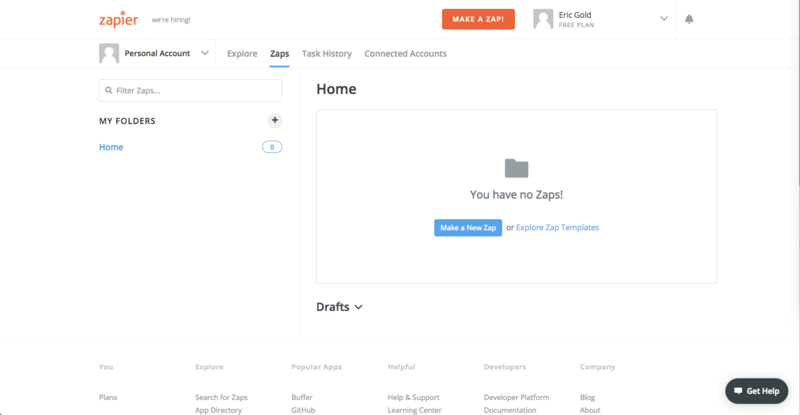 That’s where Zapier comes in. 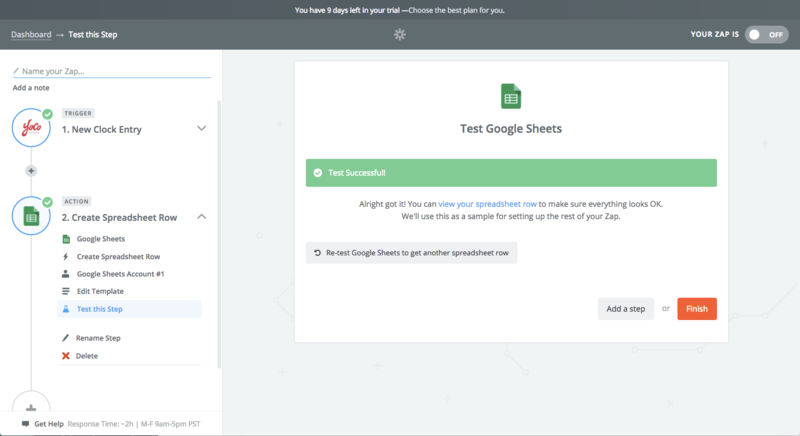 With Zapier, you can hook up YoCoBoard to a Google Sheets spreadsheet in your Google Drive. Then, whenever you clock in or clock out, the data will be “zapped” over to your spreadsheet. Then, you’ll be prompted to test the step. 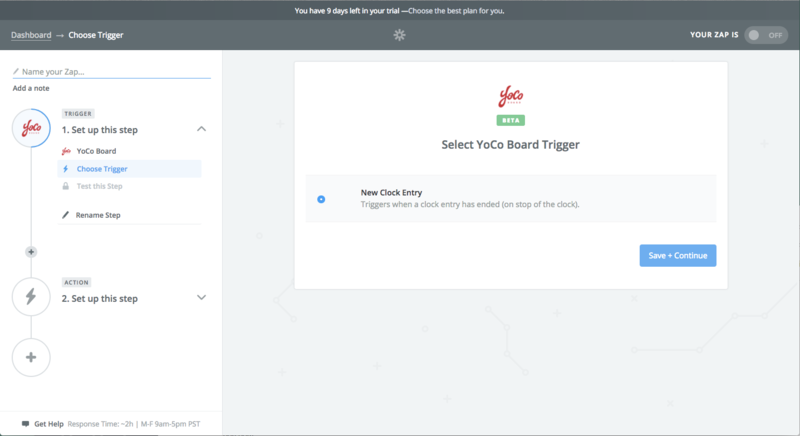 Note that you must have at least one recent time clock entry in YoCoBoard so you have something to test. 7.) 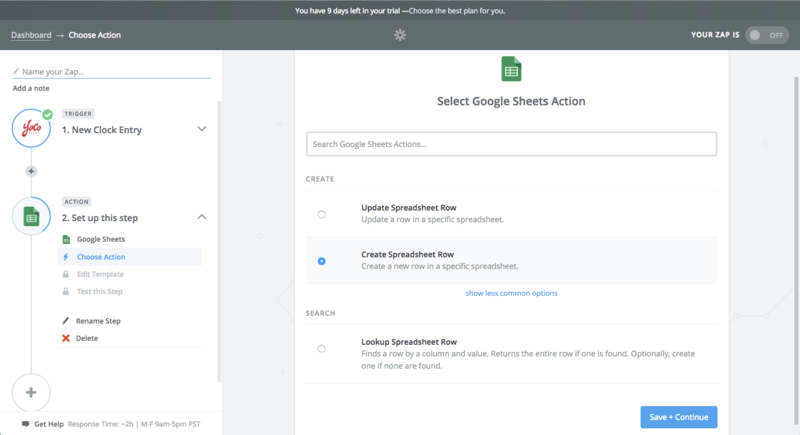 Choose the sheet that you set up in Step 1 to zap your data onto. Here, we’re using a sheet called “Andrew Gosling’s Timeclock Data.” Choose the worksheet within that sheet you want to use. 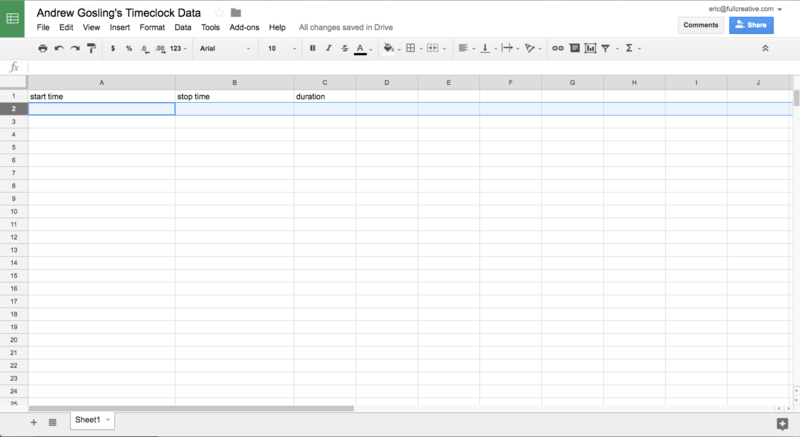 Using the fields, assign each spreadsheet column to the appropriate YoCo data: Start, Stop and Duration. 8.) Click Finish! Within moments, you should see your recent time clock entry appear in your Google Sheet! 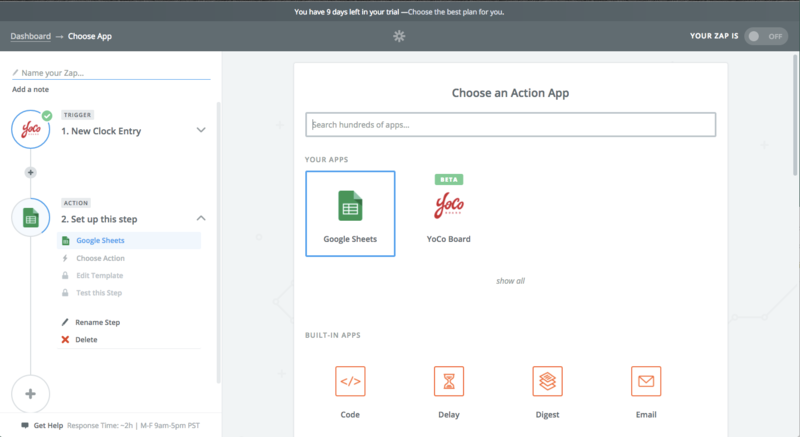 You can create multiple projects and associate your users to any of them. This way, your users will be able to clock-in with their associated projects and this helps in generating reports and getting them segregated project wise. Click on Administrator menu and choose ‘Project’ category on the right pane. Then click on ‘Add Project’ and in the popup, you can choose to associate users to this newly created project, on the fly while creating the project. If you see, there may be more users who needs to be associated to the projects, no worries, you can get back to the projects menu at point later and can associate or dissociates users. Feeds page is where you and your team can share quick status updates on what you’re working. 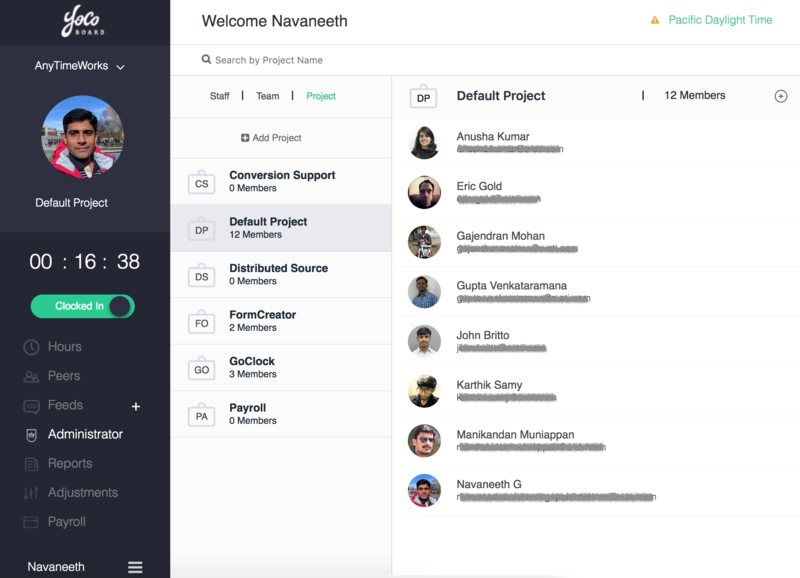 Whether your team is fully remote or works together in the same office, Feeds let you see at a glance what everyone’s working on. Peers page is where you can see your clocked in peers. This page has 3 different views. 1.) 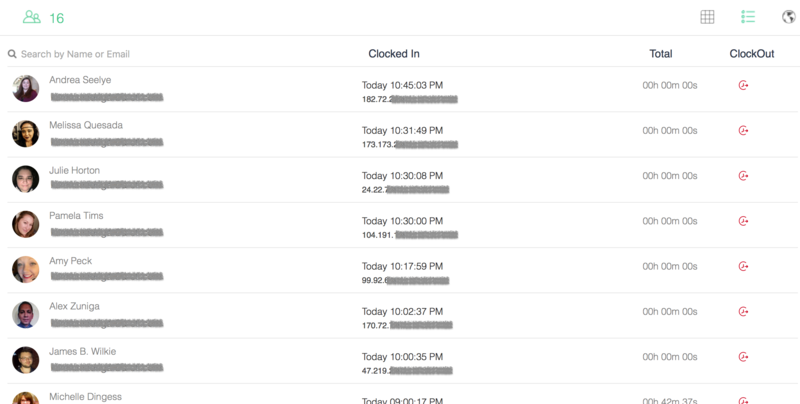 Grid view is a quick pictorial view of your clocked in peers. 2.) List view, stacks the recent clocked in peers at the top and shows the clock-in duration for peers. 3.) 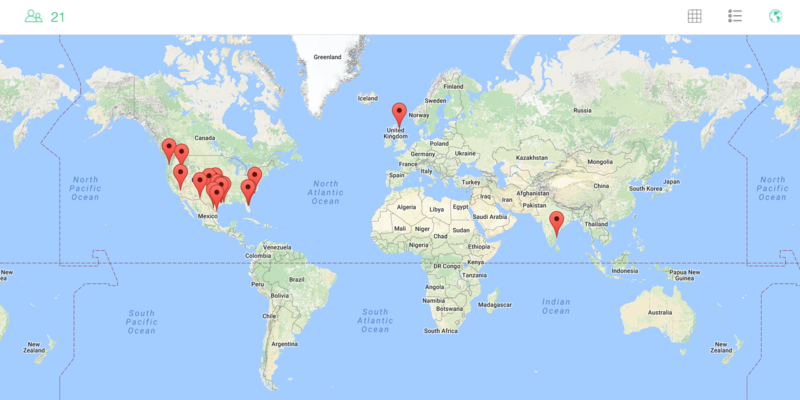 Map view, plots your peers from which geographical location they are clocked in at present. Hours page is where you can see your time records listed out. This page also lists out the current running session (if any). Also on this page, you can see your time records with their equivalent adjustments (if any).